Selcouth - Strange, unusual, rare; marvellous, wondrous. Because everyone is 'selcouth' in their own way. 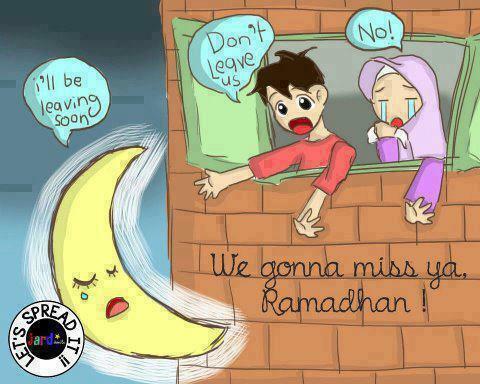 Ramadhan is leaving soon. I'm very grateful that Allah has given me another chance to experience Ramadhan this year. I think this year's Ramadhan is better than the previous year. Alhamdulillah. However, I still hope that I will be given the chance to experience Ramadhan again. Tomorrow will be the last day for us to fast during Ramadhan this year. Therefore, let's do our best in fasting tomorrow. Make zikr a lot, make dua a lot, and try our best to be khusyu' in our prayers. May we end Ramadhan with the best deed, and may Allah bless us. from the bottom of my heart, I apologize for any wrongdoings I've done towards you. I'm sorry. and if you feel like I have mistakes that need to be corrected, please, tell me. If you want me to meet/tell you personally to apologize, please do so. Let's solve the things between us in this world, rather than solving it in the hereafter. Let's end this Ramadhan with a clean heart. May we celebrate eid with true happiness. "Oh Allah! You are Forgiving and love forgiveness so forgive me." Since this is a personal blog, most of the things here are my personal thoughts, experiences, views and opinions. I blog to share, so I hope people who visit this place will gain some benefits from it. Insya-Allah, I will try to write things as beneficial as I can, no matter how small it is. P/S: I blog in both English and Malay language. It depends on the mood. © 2011-2017 | /selkuːθ/. Travel theme. Theme images by sbayram. Powered by Blogger.